If you have been to visit ICE you might as well make the most of your visit and enjoy everything else that is on offer on the site. We would strongly recommend that you combine your visit with a meal at the Villa de Flora. Our excuse is that you then don’t have to pay for car parking. If you have not visited Gaylords before it is well worth visiting the Atrium in the main building. It is described elsewhere in this Guide and is a tourist attraction in its own right. Our favourite part of it is the Everglades and we always visit to see the alligators and turtles. However, there are also additional attractions while ICE is on. Most importantly you will find a stall that will offer you a free hot chocolate after your visit to ICE and this is very welcome after the freeze. You can sit and drink this and admire the massive Christmas tree and the decorations while you plan the rest of your stay. You have an additional option this year of using the skating rink which set up in the parking lot. We didn’t do this but a lot of people did and seemed to be having a great time. There was a “Lights Alive” show at 10 past every hour and this was on the scale you would expect. 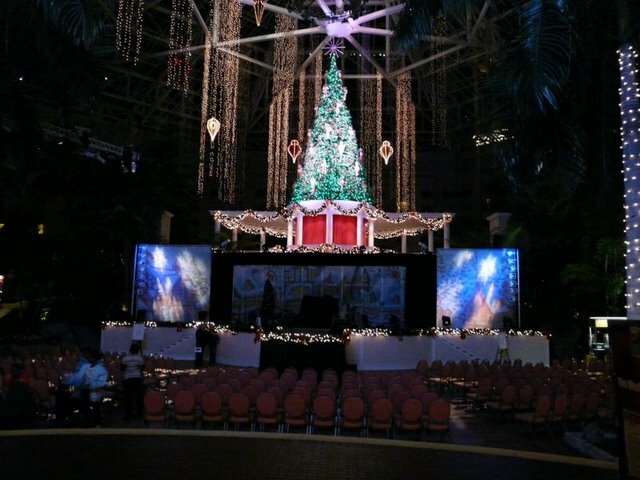 The suspended, lights, the lights around the palms, the lights on the Christmas tree and the lights in the auditorium were all coordinated to Christmas music. It is hard to describe but is certainly worth watching. At half-past each hour there is a live stage show “A Season of Wishes”. This is a short pantomime that appeals to the children but is well done and worth a watch. For children who like to be more active there is a gnome hunt throughout the resort and you can them post your entries. There is also the opportunity of having photos taken with Santa. At weekends, there are additional pre-ice shows in the convention centre. These include “Gift of Music” by the High Vista Chorus and demonstrations of Kids Crafts in aid of YMCA. Weekends also offer the opportunity of lunch with Mrs Claus. After all this you will be ready for your meal at Villa de Flora. Dinner this year 2006 is $28 but this includes as much as you want of a wide variety of salads, main courses and sweets, and soft drinks and tea and coffee at the end of the meal. Remember to get your parking ticket stamped as you leave the restaurant. Viewed 4419 times since 1 September 2008.